“Does anyone remember a nasty little dive called Stinky’s on the corner of Mountain Avenue and Foothill Boulevard in Upland? It was a little stone building with picnic tables inside, all carved up by decades of miscreants. But they had the most sinfully messy and delicious hamburgers! “When I was 10, my 16-year-old sister and I were broadsided in a pretty awful car accident at the intersection of Foothill and Mountain before there was a traffic signal. I was the only one hurt (concussion) and I recall staggering with my sister over to Stinky’s to call our parents. They offered me a hamburger, but for once in my life, I wasn’t in the mood. If it’s any consolation, Mary, El Gato Gordo has been torn down. I know many people remember Stinky’s because it’s been brought to my attention numerous times over the years. Anyone want to share memories? What I’m especially curious about is that I’ve also been told of a place named Stinky Stevens that used to stand at Mountain and 8th in Upland. Two restaurants named Stinky in the same town? So, while we’re on the topic, can anyone enlighten us about Stinky Stevens? I remember passing by Stinky Stevens all the time as a kid when we were on our way to eat at other nearby restaurants. Our family used to joke around about the name all the time as we drove by. We never tried the restaurant, probably because of its name which seemed to take away any appeal it may have had. My being a long time resident of Upland (25 years and counting LOL! ), I believe it was called Stinky Steve’s, I’m not quite sure. It all started when that place was built as a Michael J’s restaurant that was there well into the ’80s and maybe even the ’90s. Then it became Stinky Steve’s or Stephen’s, and now it’s called Tequila Hoppers. I’ve never been in the place, but I assume it’s a sports bar and grill. I think it may have been one or two other places, but I can’t recall what they were. p.s. I’m sorry, I don’t remember another restaurant called Stinky’s. I do have fond memories of it when it was the El Gato Gordo when I worked for the chain of Cask ‘n Cleaver, El Gato Gordo (the Fat Cat) which I believe is the translation and Lord Charley’s. I remember Stinky Stevens. It was next to Upland Carpet One and was the successor to Michael J’s. It turned out the owner of Michael J’s was a man named Michael. His son, Steven, had a new concept for a restaurant due to courses he had taken in college. Thus, Michael J’s was turned into Stinky Stevens. It had a strong zany western theme, but only lasted about two years and was closed. Not enough rustlers stepping up to the bar. I’m devastated that nobody has responded regarding Stinky’s on the corner of Foothill and Mountain. But, thank you, David, for letting me know that El Gato Gordo has been torn down! What’s in its place now? That crummy EL GATO GORDO was one of the best for MEXICAN food. Maybe you’re thinking of crummy TACO BELL. It’s been a busy week and I apologize for the tardy reply. Yes, it was Stinky Stevens on Mountain Avenue that took over the former Michael J’s location. The western theme was quite prevalent, with plenty of leather, wood and fake branding iron decals. The food was far from stinky, but it also wasn’t exceptional. And that location has proven poor for all the restaurants attempting to make a go there. So I was never sure if it was the name, the cuisine or the location that did them in. As for Stinky’s, I have called on quite a few family and friends but have not yet found anyone who remembers it. El Gato Gordo was, as I recall, the venture by the group that owned Cask N Cleaver into Mexican cuisine. The first one I went to was on University Ave. in Riverside, not far from UCR. It was incredibly popular, both for food and libations. The restaurant on Foothill Blvd. west of Mountain Ave. came later and, at first, did extremely well. Unfortunately, somewhere along the way the quality lagged, and the availability of outstanding Mexican food restaurants locally is just too tough. I remember Stinky’s, went there often when I was in high school. Les, the night counter man, served me a Coors when I was 14 or 15. Good burgers and chili. As I recall Stinky’s had a SKUNK on their restaurant sign ??? I remember a period of time when the front door wouldn’t close so they just let it hang there. What a fun place to go after a Pomona High football game (especially if we won). Stinky’s was great! A true greasy spoon original. Built from the stones that washed down from foothills before the dam was built. Their $.50 hamburgers were the best. We used to go there after football games and dances. Seemed you always knew someone there. Carved-up tables usually revealed who was dating who. Hello Mary, My father, who was a Upland police officer, used to go to Stinky’s when working the graveyard shift, and I remember him saying that they were the best hamburgers ever. I do recall going in there as a little lad, I remember it being rather dark inside, more of a bar than restaurant, and the stone walls, very classic early California building style. Sad when it was torn down for the BofA. Stinky’s was a popular hangout for Claremont McKenna College students (when it was still Claremont Men’s College). There is an aerial picture of Stinky’s in the book Century of Community Upland California the first one hundred years. The photo is on page 200. It doesn’t look like anyone has been here for a while, but I was reading through and found this all too interesting. First, I worked at El Gato Gordo as a teenager and wish the place would have made it through the tough times. I have many, many memories in that place. Second, my father was also an Upland police officer with Doc Seay who is Monte’s father, I believe. My Dad remembers visiting Stinky’s on the NW corner of Foothill/Mountain when he was a small child. He said that somehow the owner of Stinky’s is related to his father’s family. He could not remember the name of the owner, but he knows that it was an aunt or a great-aunt of his father. Another place that has been spoken of in this particular blog is the Claremont Men’s College. My 82 year old grandfather was a painter for the college WAY back in the day. He’s been retired from there for over 25 years now. Good to be able to share such memories with others. The world is a very small place! Do you remember Mr. Steak on Mountain Ave and Foothill Blvd? Also what was the name of the Hotel and restaurant on Foothill and Euclid Ave? I remember Stinky’s. The one on Foothill and Mountain. My boyfriend and I used to go there. This would have been in the earily ’60s. The hamburgers were called sliders. (The first time I had heard that term.) They were truly amazing. It was gone by 1967 when I moved into the apartment complex behind where it used to be. When I was at Upland High School (class of 1960) I’d go to Stinky’s two or three times a week. College kids from Claremont would come over there. There was a jukebox. The waitresses were surly. The food was great. I don’t know how it got its name but always imagined it was some WWII vet who started the place who got the nickname “Stinky” in the war. The restaurant you are thinking about which was west of Upland High School was called “Tolteca Inn” if I remember right (and it shared a building with “Brigham’s” restaurant). My mom used to frequent the Texaco station across Foothill from there…those were the days when they pumped your fuel, checked your oil and water, filled your tires, and washed your windows, all for the price of gas. I remember that Texaco used names like Skychief and Firechief for their various grades of LEADED fuel (the unleaded stuff was a ways off yet). The hotel next to the Arbor was The Uplander Motor Hotel. I think the Arbor and the motel were torn down in the 1990s, when the Home Savings building was erected on the NW corner of Euclid and Foothill. When I attended Claremont Senior High School, as it was styled then (1958-1961), Stinky’s was the place to be on a weekend night. Weekday evenings too if one could swing it! I’m surprised Charlie Bentley, a CHS Classmate, hasn’t found anyone who remembers it. He is a Clare -e- mont-er par excellence, and of the age, as they say! It was a great place, not to be recapitulated any time soon. A dive it was, a genuine dive, but a dive in those days was a great restaurant by today’s standards! It was set in an orange grove “in the country” on US 66 (Foothill Blvd.) between Claremont and Upland. It was a “longish drive” from Claremont or Upland. It was in the alluvial wash, planted in orange trees and cement quarries in those days, that still comes out of Baldy Canyon and extends to Chino in the south, a considerable distance. Since the late ’50s, the wash has been tamed by a deep cement channel that hearty souls of my generation roller-or skate-boarded down. This was dangerous, I was told, because once committed to the channel from the Claremont/Upland end, there was no climbing out until miles south in Chino — and no climbing in by rescue teams. Lots of my CHS classmates frequented Stinky’s, including John Frank and I. Others I won’t mention. One of the commenters mentioned a skunk on a sign. I do not recall that clearly but I recall it hazily. Mostly I recall the rock walls — a common building material in those days, rounded by the alluvial wash of the centuries, and thus fit for building, walls, curbs and even some roads. Well, enough is enough and if anyone sees this, well enough. The old are not wanted. Does anyone remember the bowling alley on north Garey Ave. in Pomona not far from Henry’s in the 60’s and I believe 1970’s. That was also a popular hangout. Stinky’s at the corner of Foothill and Mountain was the favorite retreat for students of the Claremont Colleges when I was an undergraduate at Pomona College from 1953-1957. When one’s palate was sufficiently bludgeoned by the insipid local institutional diets, one always retreated to Stinky’s for what were regarded, rightly, as the best hamburgers anyone ever ate — not sliders, but full-sized beauties dripping with all of the fats and juices regarded as lethal by later generations more attuned to more mundane questions of life and death. Attempts to reproduce at home the singular flavors of a Stinky’s burger always failed, despite the fact that there were no unusual ingredients to have to conjure with. Most of us ultimately concluded that those flavors came from grill that had, over the years, been infused with the aged oils of the ages. Nostalgia, I know, has the capacity to elevate memories beyond the actual realities that engender those memories, but, when I returned to the area after a seven-year absence, I betook myself instantly to Stinky’s to renew gustatory acquaintance with those burgers; they were just as great as I remembered. No one, since, has ever duplicated Stink’s remarkable triumph. We used to go to Stinky’s to participate in the great greasy burgers and underage beer drinking if I recall correctly. Great spot in early 1960s. Stinky’s indeed had a skunk on their sign. This was a small rock house. The place also had a small room containing a counter with maybe 8-10 seats and a wall of carved up tables and booth seating. Atop each table was at least one gold-colored metal ashtray with the name “Stinky’s” and the address emblazoned in black ink. The ashtrays were typically brimming full of cigarette butts. In 1962 or so, I pocketed one of those ashtrays, as the owners halfway expected everyone to do, and I kept it for years. Finally this treasure went the way of all glittery things, in a box lost during a move. I remember the two grizzly older men who worked the counter and whipped up the burgers. They wore work chinos and checkered shirts. Can’t recall if crisp white aprons were part of the ensemble. I preferred Jack’s on Foothill because there was no old beer smell, the owner/operator was nice and enjoyed people, and if the restaurant was uncrowded, you could dance on the large floor to the music pumping from the juke box. Barbara, I was looking to see if I could find my dads restaurant from the 60’s and found Stinkey’s which we used to meet for our car rallies for CRAS. Then I saw your blog that mentioned my dads restaurant. I was 16 when he bought it. I worked there along with my brother Denny, I’m Rick. Anyway thought I would reply. Old times. I have a couple of pictures of Stinkey’s inside. For Ray S., Of course the bowling alley across from Henry’s was a Saturday afternoon must during the summer because the place was among the first to advertise “air-conditioned!” in a large banner under their name. This was not the Thunderbird lanes, which was down near Holt in Pomona. This was another bowling alley, and newly constructed in 1960 or so. I always called it the Bowlium as a joke, and for so long I can’t recall the real name of the place. During the weekend nights, the place was overrun with high school students old enough to drive, who bounced between cruising Henry’s and hanging in the parking lot at the bowling alley. The weekend days the place was overrun with a younger customer set. I still can taste those burgers. My dad took me and my brothers on the weekends sometimes and i remember the tables. A burger and a dr. pepper when i was about 6 yrs old or so. 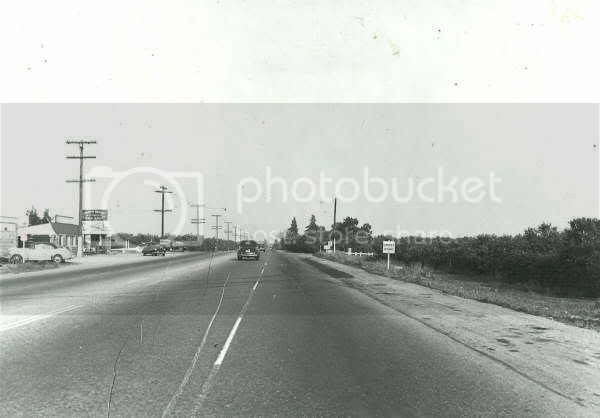 Heading east on Foothill Blvd towards Mountain, 1946. Foothill was then Route 66. The place on the left is Stinky’s. Stinky’s wonderful. My recollection is that it closed while I was at CMC, between 67 and 71. The burgers were divine. It felt just biker-ish enough that I think college kids felt as if they were mixing with a different world (ha!). The rumor was that it closed because someone poured concrete mix in the toilet. If so, I really hate that person. 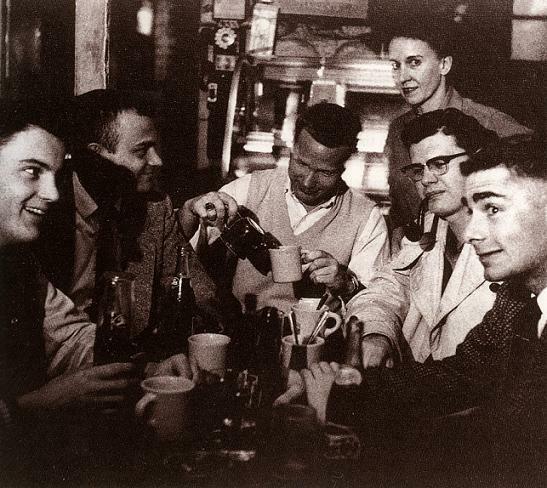 Sitting on the carved-up benches on a hot late summer night, washing down dust and burgers with whatever college students drank was a marvelous time. I am thinking of a small restaurant on Foothill’s south side just past Central corner & an old gas station. Claremont High students went there for tasty burgers after football games. Anyone remember this long past place?